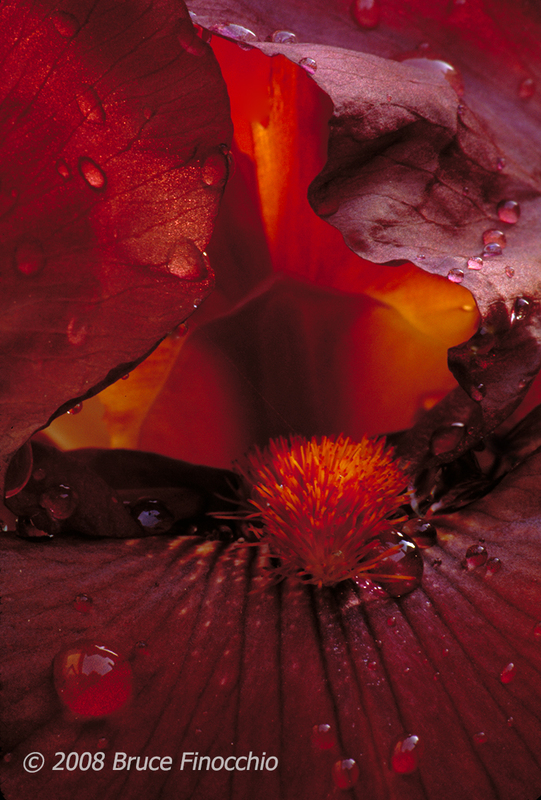 The base image or original image is a deep dark red bearded iris from my mom’s garden. When my mom was still alive, I used to take a lot of images of her bearded irises. They are a very deep flower, and I used to have to set my aperture to f32 or f64 to get the back parts of the flower somewhat sharp. If done properly, the macro images resemble a very colorful cathedral. For camera club competition, I would wait to the last minute to come up with a title. I would insist that the image title had to be the real name of the iris. My mom and I would pore over her iris catalogs looking for the right iris. This would exasperate her, especially the time crunch of my waiting until the last moment. These were the days of slide shooting for me, and I would write the title information on the slide then dash off to the camera club meeting. Looking back, I feel bad that I put my mom through this every time I entered an iris image. She could have refused to help, but her character shined true and her love for me was always there. I think she would be happy and proud of me with the creative art I created from an image of one of her irises. The technique is from a tech tip column from a PSA (Photographic Society of America) magazine. “Put a little twirl into your work”, was the title of the article. I look for colorful graphic images that have a significant negative space. Then, I follow this technique of creating lines, blurring them, and then using Photoshop’s twirl filter, making a twirl with a positive setting, then on another layer using the opposite twirl with a negative setting. For me, these images remind me of deep space. Thus, my space portfolio was born. 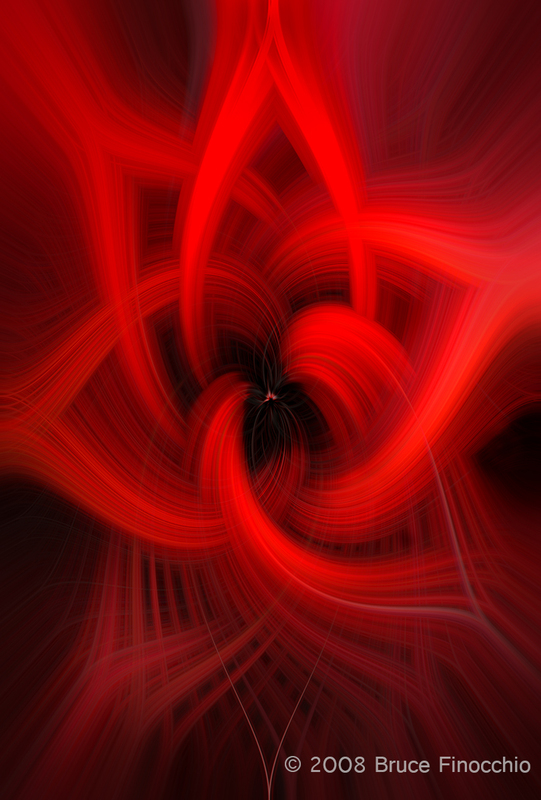 With other base images, I have created a group of a dozen or so of these types of images. One base image is an image of the Palace of Fine Arts in San Francisco, another is orange wet sand from a beach at sunset in Santa Cruz. I never know exactly what I get when I play with this technique, but that’s why it is so fun. In memory of my mom, Lillian A Finocchio, I dedicate this image to her. It is like she is still here with me. We were so close. I miss you so much; I’ll always love you, mom! Metal Print of this Image is now showing at the Avenue 25 Gallery through January 18, 2019. 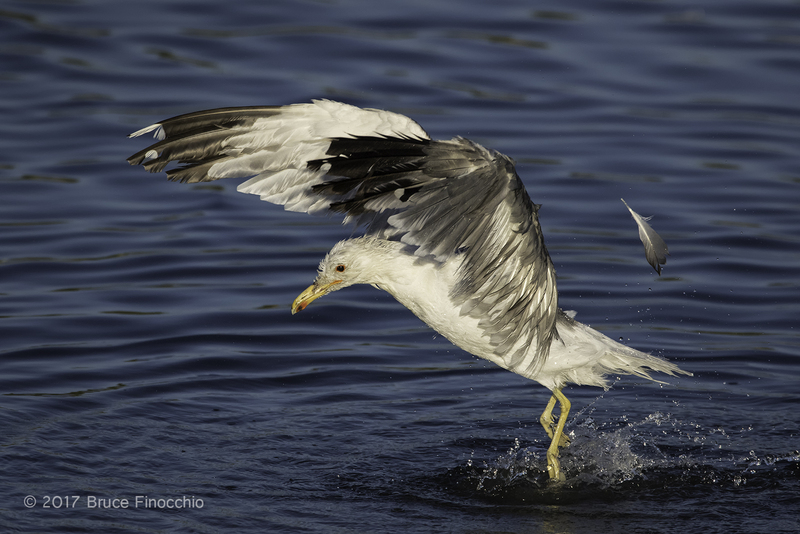 Title: California Gull Shakes Feather Off While Bathing. Goal: I belong to three Bay Area birding lists or groups, East and South Bay, as well as Peninsula Birder’s Group. I receive email postings by members as to rare and unusual sightings. Birders also just publish their adventures and sightings to share with other birders. 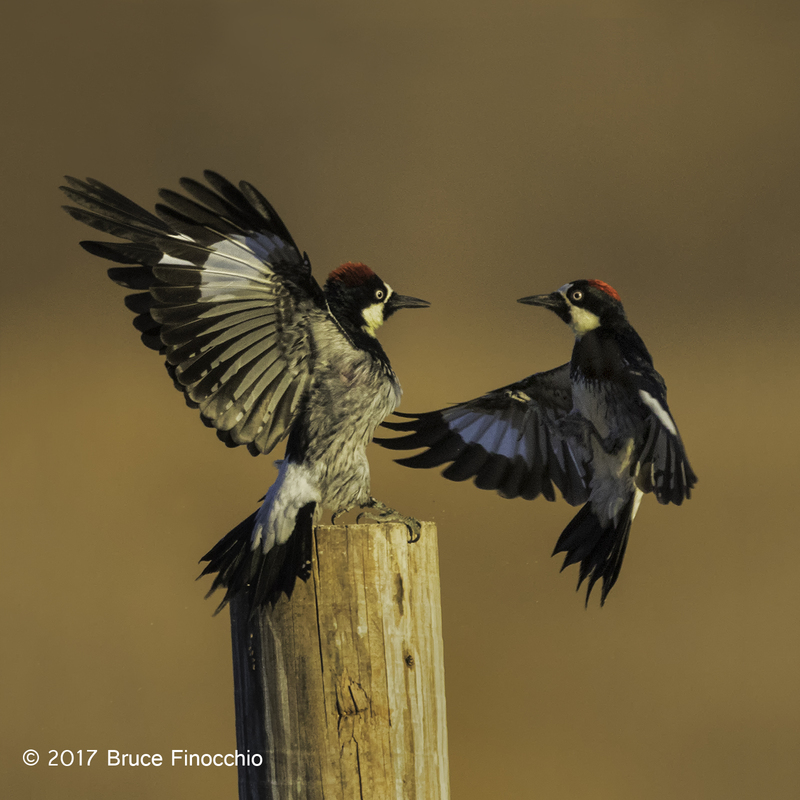 Its focus is birding, but many bird photographers use these postings to find and photograph rare and uncommon species. I am no exception! However, there is a big difference between birders and bird photographers. One obvious difference is that birders take pictures mostly for identification, whereas bird photographers are trying to create art. Another one is photographers need to get close, very close to make compelling beautiful imagery. I could go on with the differences, as I have in a previous blog post. The point is that I was following a lead to find and photograph phalaropes in Sunnyvale, in the South Bay. When I saw the poor digiscope camera image from a birder; I knew that I was chasing a “wild goose”. Yet, because of his effort to tell me where the phalaropes where, I went anyway. I tried hard by putting my big 600 mm lens and tripod on my Rolle cart and got about a mile out, but the phalaropes were way out there another couple of miles. Too much for me to physical at this stage in my life. I decided to head north on the west side of the bay instead. I ended up at Atascadero in Palo Alto, here not that far from my car I found a shallow pond that must have been fed by some underground water source. It was July, not April and most or practically all non-tidal water had disappeared. I noticed a large collection of gulls in this pond, and I notice the center area seemed to be a little deeper and flowing or upwelling with water. The gulls were taking advantage of this relatively fresh upwelling and flowing water by bathing. Even though it was still hard to get close to them because the water surrounded by a dry pan and the levy I was on was still farther away than I liked. Nevertheless, I had the reach with my 600 mm lens and a 1.4x tele converter and a cropped sensor with my 7D Mark II camera body. The light was working for me; the sun was setting in the west behind me. Perfect conditions for creating painterly nature images. I kept waiting for them to bath and then jump up in the air which is their typical behavior, not all the time, but most of the time. I also took a few flying in and out images as well. Trying to take advantage of the beautiful photography conditions in any way I could. You are waiting for the moral of the story or the point. Well, I could have given up twice: once by not going at all, second throwing in the towel after my researched location was a bust, but I didn’t give up and persisted in my efforts. As a result, I think I was richly rewarded. Nature is full of surprises, and it never disappoints if you’re opened to its secrets and its mystery! Equipment/Source: 600 mm IS f4.0 lens, 1.4x tele converter, 7D Mark II camera body, on a Gitzo 3025 tripod. Shot Information: 1/6400 sec; f7.1 aperture; ISO 1000, Aperture Priority Shooting Mode, and Evaluative Metering, No Flash. Technique: The light was so good I didn’t do much to the raw capture file. Some slight cropping targeted noise reduction and sharpening. Also, I did a mid-tone contrast enhancement technique using the RGB channels layer. There is one point or criticism of the image that I know of, but it couldn’t be helped. I am interested in seeing if anyone mentions it. Bob Brown correctly pointed out the flaw or possible flaw depending on your viewpoint. I took the photo from a top of a levee. I was higher and above the gull and the bathing area. Ideally, I would have like to be at eye level, for the possibility of a more dramatic image. Looking down on a subject is condescending and implies an inferior place or position. However, since I was so far away, my angle of view above eye level was minimized with my 600 mm and 1.4x teleconverter. David is right there is a slight very slight tilt of the horizon to the left. Also, if I tried to get lower, picking my way through the tule reeds covering the bank, I would have disturbed the birds, causing them to disperse and possibly abandon the bathing site. In this situation, the view angle above couldn’t have been helped. Yes, I would like a little more room on the bottom too. However, I purposely left more space above as the gulls would jump up a lot of the time after bathing. I didn’t want to miss or crop out parts of the bird, especially its wings. If you don’t pre-plan for the jumping out of the water, you are going to have a lot of images where the wings will be clipped. I don’t have a 50 MB camera body. Thus, no option to crop post capture by using a smaller sized lens or less magnification. The water disturbance made for a poor reflection, more important to me was to contain the image of the gull in the frame. As far as cropping, I did want to include the concentric rings of the water at the legs and the jumping off point. Cropping this out, I think would take something out that is contributing to the nature story. It’s a third or four element that adds to the story and the composition, not subtracts. I am pretty tight as is, as Steven says. I hope this helps in the understanding of the choices I made here and gives you a feel for what is necessary to think about when you are faced with a wildlife moment. * I changed the names to protect the privacy of my fellow nature study guide participants. My “Little Bee Eater Toss Moth In Air Before Swallowing” image made the top one hundred images in the NANPA Expressions 2016 photo contest. My “Little Bee Eater Tosses Moth In Air Before Swallowing” image made the top one hundred images in the NANPA Expressions 2016 photo contest. There were around four thousand images submitted, to make the top one hundred is a high honor indeed. We were in Tarangire National Park, the fourth day of our three-week safari. We had driven most of this particular morning and were at the edge of the large Lormakau Swamp. My friend John who organized the trip is a bird photographer like me. As a result, we weren’t just after the big five. In fact, John knew our driver and had especially requested him, because they had built up a good relationship over John’s previous trips to East Africa. Both the guide/driver and John loved birds and shared that love with each other. On the most difficult sightings when they would disagree about the identification, I would keep a mental scorecard of who was right and periodically announce who was ahead. They were very competitive in a friendly way. John’s wife and I were keeping a bird species list as we went from National Park to National Park. During this particular moment, we were photographing a big bull elephant feeding on the edge of the swamp. On the hillside above the swamp where we were parked, there were several large bushes with open branches on top. Since we had been stationary for quite a while. The little bee-eaters resumed their hunting and sallying from these bushes. They came down the slope sparsely dotted with acacia trees. Important was staying put, this allowed the bee-eaters to become accustomed to our presence. Because they were so close, both John and I were watching this particular bee-eater with our cameras trained on it. When it sallied out it would usually come back to the same perch; we didn’t attempt to track our cameras out trying to get an image of it flying. Our focus remained on the perch when it came back with the moth, we were ready when it tossed the moth into the air, before eating. John and I got the shot. A fortune shot, yes, but those who are prepared and observant do get the prize. A fortune shot, yes, but those who are prepared and observant do get the prize. Equipment: Canon D7 body, 600 mm IS f4.0 lens, with a 1.4x Canon III teleconverter, 840 mm at 1/3200 of a sec, f6.3, ISO 1250, Pattern Metering, no flash. Technique: 600 mm lens mounted on a bean bag from the top of A Safari Type Landrover vehicle. Processing: Some darkening of the background and slight reduction of overall contrast with Nik Viveza. Raw conversion with Photoshop ARC, some cropping. This image is also part of my Wildlife Beyond Borders collection. You can view the rest of the images here. My Astounding World of Birds. Also, you can find more information about this incredible collection of images at our Facebook page. Taken for granted are the sounds of nature, bird songs in the morning’s dawn, the whispers of the wind gently touching your face, and the powerful smell of raw wilderness. These are a few of the healing and soothing gifts of the natural world. Too often today, we have divorced ourselves from nature. This loss of connection has sent us adrift. Most of us are ill without even knowing it. There is so much nature can bestow upon us if we accept its gifts and live close to it. A timeless peace, a sense of harmony and balance, and a belief in the essential goodness of life are a few of the benefits of living with nature. I have a friend who is a morning person. He would get up very early before dawn and prepare some coffee on the gas burning stove at the cabin we shared. Then, he would go outside with his cup of coffee and wait for dawn to break and watch the day begin. He would listen to the birds’ songs begin as the night passed to day, as the darkness faded minute by minute. This simple act gave him peace and rid him of the anxiety created by life in the modern world. I treasured sharing these moments with him; they became part of my early exposure to tranquil powers of the wild. We shared another passion. He fueled my desire to learn about the birds whose calls we heard, to distinguish one from another, to learn their calls by heart, and discover their unique behavior of each individual species. I started my first species list. The mysterious California Thrasher whose spring calls from the tops of the chamise bushes first intrigued us became the first species on the list. Yet, at some point keeping a list was not enough, nor was just taking their pictures. After a few years, I took my creative passion to capturing their beauty, their very essence, and their spirit of life. I now have gone a step further with my art and my photography to capturing the sacredness of life itself. In this way, I can share this sacredness of nature with others. Through my images, they can glimpse within their hearts and minds the mystery and wonder of the natural world–regenerating the strings that once connected and attached them to the earth. They can learn not to take nature for granted, especially the morning serenade of bird songs, and again become part of the sacred circle of life itself. Here with my Wildlife Beyond Borders collection of bird images, I hope to ignite the love of birds, spark feelings of marvel in their brilliant colors, and open people’s hearts to their unique world. 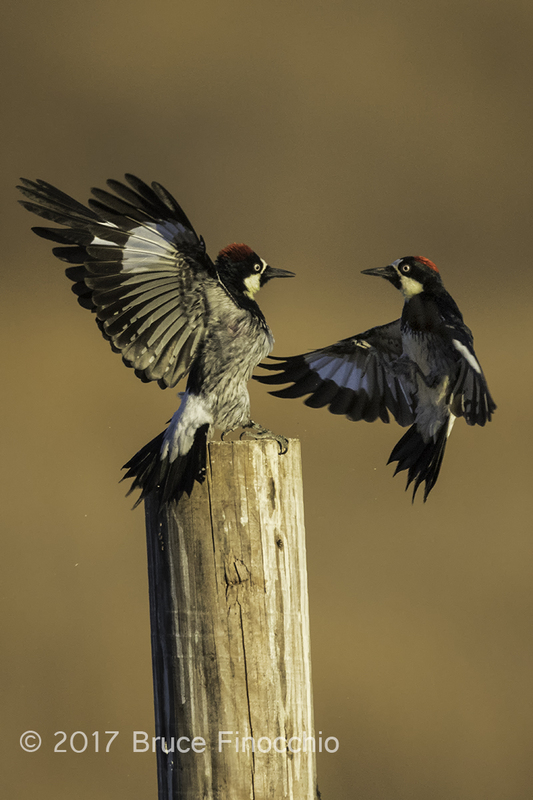 Wherever we are in our daily life we must listen, and not take nature’s gestures for granted, for bird songs are windows into the natural world. Some may say this is the fanciful thinking of an idealistic dreamer. Yet, I believe in the power of nature to heal, comfort and soothe the human soul. All my life experiences with nature have led me to know this truth. Come to the Wildlife Beyond Borders reception at Keeble and Shuchat and learn more. Meet my fellow artists Mary Aiu, Susan Carnahan, Diane Rebman, Wendy Hannum, and Oliver Klink. Reception is Saturday, April 16, 2016, from 2:00 PM to 5:00 PM at Keeble and Shuchat, 290 California Avenue, Palo Alto, CA 94306.